One thing I get asked a lot from other moms is how I get anything “else” done (other than keeping 4 little humans alive). Some days, it can be a challenge to figure out when I’m going to shower much less do the laundry or write a blog post. The honest answer some days is, I don’t get anything else done. But for most days, the beautiful thing about Babywise and a Parent-Directed Schedule is that it provides a framework for the day and offers opportunities to be productive and keep your home running smoothly. It doesn’t take a very long time of using Babywise to see the ways it benefits your baby. I have watched all of my babies relax into the schedule and thrive from consistency and from getting enough sleep. But what’s great about your baby and kids benefitting from a schedule, is that you also reap benefits. A few weeks ago, I wrote a “day in the life of” post about what a typical Monday looks like for me. My sister called me after reading it and said “You had a very productive day… how did you do that?” As I read back over it, it was so clear to me that the reason I was so productive that day is because I utilized my schedule in ways that allowed me to spend time with my kids and get things done. I always like to think of my schedule in the “ideal” realm whenever I’m making a new one or adjusting one. If things went perfectly, this is how the perfect schedule would look. It RARELY ever fleshes out completely to the ideal, and recognizing this is important, but it gives me a starting place, a goal, and a place to come back to if I need to re-group. Just because you write something down doesn’t mean it will magically happen, but it certainly helps with the “mommy brain” and helps you stay ahead of yourself instead of later in the day thinking “Oh yeah… I was going to try to do it this way”. Make a list. The days that I make a to-do list are significantly more productive than the days I leave it to chance. The tasks continue to float in my head until I have to end up staying up late to get them done or putting them off. Look at your daily schedule and think through times that you can plan on showering, household chores, devotionals, fun (ß dare I say it!). The key times I plan for are naptimes, independent play times, and screen times. None of those things are a free-for-all in our home, but are always a planned, consistent time. If you are really struggling to complete a specific task because of lack of time, think through your schedule to how you can move something around or change something. One of the best changes I made in my schedule was moving screen time to the time when I am fixing dinner in the evening. Like most Moms, it is my most stressful, tired, time of the day. It might be as simple as moving family dinner up 30 minutes or back 30 minutes to create more time for bedtime routines or more time for dinner prep. It might also mean you need to eliminate something from your schedule or relax your schedule on something. 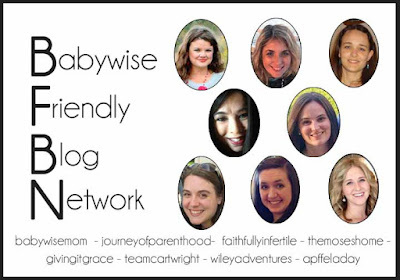 One of the biggest critiques to Babywise or scheduling in general that I hear is that it lacks flexibility. My thoughts are that if you have a schedule, YOU are in charge of it and can flex it to fit your needs. If it were just a free-for-all every day, I would feel like I am serving the day more than my day serving me. Ultimately, I think it is important to remember why you use a schedule in the first place. For me, it is because it helps meet the needs of my whole family, not just a baby or child, and it keeps my family running on a long-term basis as well as a daily basis. Check me out over at The Moses Home today–I am talking about the dreamfeed.